When Amazon gave me the opportunity to purchase their new voice command-activated device, Echo, I very impulsively hit the “buy” button. Three months after I ordered it (I’ve read others were given shipping dates of June or July), it arrived in a nondescript, matte black box, about the size to contain a single shoe. Inside was the Echo itself, an Amazon-branded power supply, and a remote control identical to the one that ships with Fire TV. Setup is performed via the mobile app and is pretty straightforward. 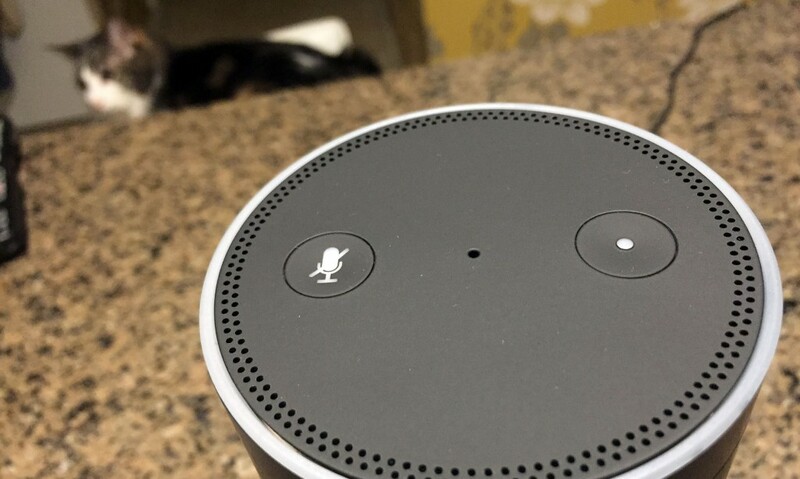 You interact with Echo using a safe wake word, which, somewhat counter-intuitively, is not the word “echo.” Currently you can only say “Amazon” or “Alexa” (Amazon’s homage to the library of Alexandria, of course), who is Echo’s answer to Siri. But more wake words are promised for the future. It’s a tall, 9.25″ characterless cylinder. Characterless until you interact with it. During setup, the LED on top glows orange and after performing the wake word, the light ring animates a very satisfying blue. It’ll also glow white to indicate the volume level. When I ordered the device, I immediately regretted my decision because I wasn’t convinced I really needed it, but ultimately figured I’d give it a chance. A few days in and it’s actually pretty awesome. The voice recognition is pretty remarkable and beats the capabilities of Kinect and Siri by a mile. Maybe it’s because of my screwed up Scottish-living-in-America-for-10-years-accent but I haven’t always had a lot of luck with other voice command devices. Echo is different. Alexa — unlike Kinect and the ladies of my youth — understands me. Echo is essentially a glorified, but decent-sounding Bluetooth speaker with seven always-on, always-listening microphones. Unlike other flawed devices, you don’t need to shout. You can talk at a regular volume and the microphones can pick up your voice from any direction – even a room away in my tests. It also has enhanced noise-cancellation so it can hear you over music. 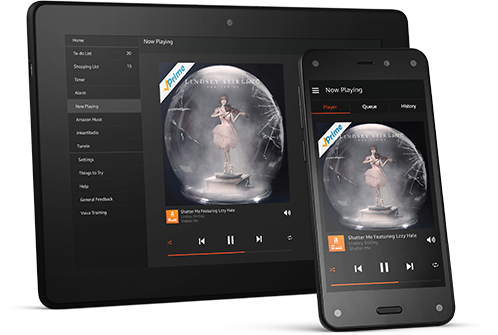 Speaking of music, Echo gives users a couple of options. You can pair the speaker to your phone and stream over Bluetooth or you can use Prime Music, iHeartRadio or TuneIn. It’s pretty cool that I can say “Alexa, listen to The Current” and the radio station will immediately start streaming. Whether or not I have followed that up with, “Alexa, stop listening to Hozier” is another story. You can also ask for weather and news briefings. Here’s the best feature though: shopping lists. You can add items to a shopping list or to-do list and they immediately update on the Echo app. I placed the device in my kitchen so it has proven to come in pretty handy. It had no problem hearing me when I added “toaster strudels”. However, saying it out loud made me question why, in my 30s, I still eat toaster strudels. Of course it has its flaws. It’s an Amazon device so obviously it heavily relies on Amazon’s services and while the shopping list feature is cool, you can only add one item at a time. The biggest issue is how limiting it currently is. It just doesn’t do enough. Had they launched with third-party, out-of-box support for products like Hue or WeMo, it would be a much more compelling purchase. It would be awesome if I could use SmartThings to check if my garage door was closed or to lock my doors. They have put the call out for developers to email in their ideas but it really needs recognizable partnerships to get off the ground. I’d also love to see more synchronicity with the mobile app. Last night, I set a 8-minute timer but left the room and didn’t hear it when the time was up. Emily has been using the shopping list feature a lot but unless I check the app, I’m not aware that she has added to it. I’d love to be able to be alerted to these via push notification.